Stephen Merchant made the role of Wheatley in Portal 2 look easy, but it was one of his most mentally taxing projects ever. In anticipation of reader rage, please know that this post will spoil very important portions of Portal 2 that you may not want spoiled. Thank you. Anyone that's played their way through Portal 2 already knows how great Stephen Merchant was in the role of personality core Wheatley. While first appearing to be a one-dimensional character, Wheatley progresses from a good-natured sidekick to a mildly devious, bumbling villain. Merchant says that the breadth of the role, in addition to the amount of work required, was absolutely exhausting. 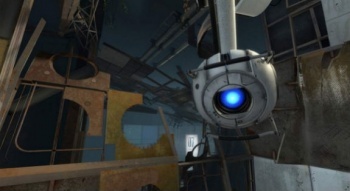 In an interview with MTV, Merchant revealed that videogames had slipped off of his radar since college, so he didn't know exactly what he was getting into with Portal 2. When fans became more excited for it than "anything he's done before," it was weird for him. "Suddenly I realized, this is quite a big deal and what I thought was an easy gig, I suddenly felt this responsibility to try and do a good job," Merchant said. "I have to say, I found the entire thing really exhausting," he revealed. "More than anything I've ever done before because I'm in this little recording booth, shouting down these imaginary corridors, imaginary gantries, pretending to fall off things and really trying to move around and live it as best I could ... I was really working hard to try and put myself in that environment, I guess, which is not something I normally do as a performer." The mental stress of the role only got harder when Merchant had to act out Wheatley's evil side, after the AI core goes mad with power. "The thing which alarmed me was the fact that I have to shift from being lovably hopeless to being hopelessly evil," he added. "I was actually a little intimidated by that, it's not something I feel naturally comfortable with, being villainous ... I wasn't really expecting that, because I hadn't read the whole script up front. So that was a little worrying, would that work." Merchant said that once Wheatley's recordings were wrapped, he was so tired and exhausted that he thought: "I can never do this again." Still, he's surprised and happy with the response to the game, noting that videogames are a "really legitimate, creative art form now," ranking right alongside movies and "whatever else people really take to their hearts."